greasing system and multiple safety devices, easy for enance and can size changeover. 1. Machine type S-B31 S-B31H. 2. Range of can dia. 200 - 401D. 4. Capacity Per Min. 3H Up to 300 CMP 3H Up to 300 CMP, 6H Up to 600 CMP, 6H Up to 500 CMP, 8H Up to 800 CMP and 8H Up to 600 CMP. 5. Horse power required: 3H 3HP, and 6,8H 5HP. 6. Floor space overall height: 1900 x 1200 x 1500, 2000 x 1200 x 1500 mm. 7. Net weight 2500 - 3200 kg, 2500 - 3200 kg. 1. 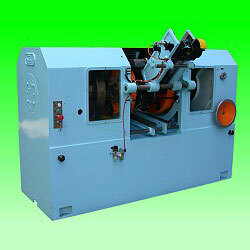 Simplify mechanism easy to operating and reduce cheduled shutdowns. 2. With auto lubricator easy for maintenence. 3. Variable speed control for line production. 4. Can guide and Turrets with hard chromium plating or Nylon material. 5. Full Automatic Control system for canmaking line requirement. 6. Multi-safety design for machine and personnel safety. 7. Equipped with tungdten carbide necking outer guide tooling. 8. Equipped with high speed steel necking inner core, Carbide material is available on request.